General USB devices receive exceptional support by the PS3's operating system and the PS3 plays very well with most USB accessories. Supporting numerous accessories and devices since launch in ways its competitors, well... simply wouldn't, is another reason that the PS3 is such an exceptional console. Most USB devices out there probably have some PS3 compatibility one way or another, so it's impossible to physically list them all. Rather, here is a set of guidelines to determining what will work and what you can do with it. All of these devices are implied to be PC-compatible. USB devices that are made for other game consoles specifically, such as Wii or Xbox 360 accessories, usually will not work. A device made for a home computer generally works fine. All of these devices are assumed to be wired. Devices that are wireless and use a USB-connected receiver or dongle are hit-or-miss, oftentimes requiring more than the usual plug-and-play drivers. This USB device is highly recommended if you are going to do any web browsing. Principally any USB keyboard, once plugged in, will immediately take the place of the XMB's onscreen keyboard. There are very few USB keyboards on the market that won't work with the PS3. Any USB keyboards with additional functions beyond the standard 104-key / QWERTY layout, such as browser or media player shortcuts and keys, will only perform the standard functions on the console. When not in a game, a USB keyboard gives you nearly complete control over the XMB. You can navigate and perform XMB functions (including the web browser and file management) entirely without a controller. This is incredibly useful when using a PS3 for chat functions or as any kind of media center. As the number pad serves very little function on the PS3, 'mini' keyboards are excellent for your console. By eliminating the number pad and slimming the whole unit down, they are much easier to keep stored by your PS3. Though a bluetooth keyboard would eliminate most of the storage woes, USB mini-keyboards are also very inexpensive. Any wired USB mouse on the market will function at a basic level on the XMB, particularly the web browser. Mice with additional functions and programmable keys will operate on the standard two keys and scrollwheel. Very few PS3 games have mouse functions, however, and the XMB itself makes little use of it. Keeping the wires sorted for a USB mouse adds a lot of clutter for very little purpose, so it may be better to go for a bluetooth mouse or just no mouse at all. Any! a great USB device along with the keyboard for surfing the net. Any standard USB thumbdrive will be recognized by the PS3 immediately, and can be used easily to back up game saves or move media back and forth. Anything copied from the PS3 onto the drive will automatically be put into standard PS3 directories for later use. Anything being copied FROM the external drive will either need to already be in a corresponding PS3 directory or be accessed via 'View All.' More information about navigating these directories in the XMB section. Any! but, 4GB & 8GB models tend to be the best values right now. Our favorite of all USB devices, a non-solid-state, external HDD is not as simple as a thumbdrive. The PS3 requires a USB hard disk to be FAT32 formatted in order to recognize it. While many pre-manufactured USB hard drives come pre-formatted as NTFS, they can usually be reformatted via PC using Windows utilities. The problem with Windows is that it generally will only format FAT32 to 32GB. The simple solution to this is a free program called Swissknife from CompuApps. This program will allow you to format up to a 2TB drive to a FAT32 file system. There are also other alternatives available around the net. An external hard disk can be an invaluable asset to your entire household, especially when made compatible with your PS3. It can be used as a central place to back up nearly any PS3 game save files, and all of your PS1 and PS2 memory card saves from backwards-compatible units. Even more useful, avid users of the PSN Video store will find that they can backup protected PSN Store videos (Television Episodes, Movies) to their external drive if they need to conserve space on the PS3's own internal storage. Unlike game content downloads, Video content can only be fully downloaded once and is then purged from the PSN downloads list. By backing up these videos to an external drive, they can be browsed and then 'restored' to the PS3 when desired. More information about PSN Video Backups can be found in our XMB Management sections. As mentioned above, most external HDDs ship from the manufacturer with NTFS-formatting. 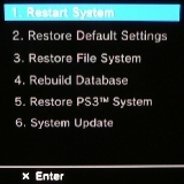 If an NTFS-formatted device is plugged into the PS3 console it will either not be readable, or it may not show up in the XMB at all. If you are reformatting a drive for use with a PS3, remember that all data already on the drive is erased when reformatting it to FAT32, and that individual files over 2GB in size may not be saveable to FAT-formatted drives. We really like Western Digital but, most modern brands will serve you well. This aspect can be either a large 'duh!' or a larger 'wha?' for some; USB game controllers may seem like a no-brainer to most folks, but a little experience with gaming consoles will usually tell you it generally doesn't work. The PS3 is an exception- it plays well with the majority of PC game controllers, usually assigning buttons in the same arrangement as the standard DualShock layout. The PS3 has built-in drivers for many standard USB devices such as these. Essentially any plug-and-play USB game controller will have basic functionality right away, with most USB pads on store shelves already having a familiar four-trigger, four-face-button layout. Gamepads with dual analogs will be assigned the same functions as a Sixaxis or DualShock's sticks. Gamepads without analog sticks sometimes assign their d-pads to the functions of the left-stick, depending on their design. It's important to note that none of these controllers are effective replacements for designated PS3 controllers. None of them will have Sixaxis tilt/motion sensitivity, and generally won't have a functioning equivalent to the PS Button either. The controller will be assigned to the first available numbered 'slot' (1 through 7) when plugged in and cannot be changed manually. Games that require the motion sensor will not compensate for its absence, and those functions will not work. This aspect of compatibility should not be overlooked, however, because most USB pads are GREAT substitutes for extra PS3 controllers when you're in a pinch and have a lot of players! Simple multiplayer games like LittleBigPlanet or all-out 7-player sports titles and party games like Bomberman Ultra play great with even the cheapest d-pad controllers for a fraction of the cost. Dual-analog USB controllers are generally available in the computer aisle for under $20. The Microsoft Xbox 360 wired controller is not readily compatible with the PlayStation 3. It requires drivers that are not available on the PS3 console. Likewise, wireless PC accessories with USB dongle receivers, or any pads with proprietary drivers to install will definitely not function. Logitech makes excellent inexpensive PC controller pads.